The Tux Table is the latest edition to the Maze Collection from Irvin Studio and Design. It shape is derived from the hourglass shape of a bow tie and features an intricate maze pattern on the top surface that again reflects the shape of the overall table. This pattern is completely hand cut and applied by hand. The changing grain direction provides for an eye catching design. 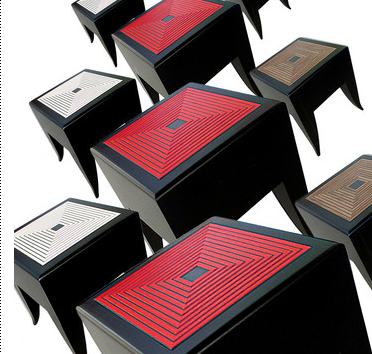 Available in a variety of colors from the finest Italian dyed veneers. Red, Silver, Willow Green and Maple shown here. Additional samples are available upon request. Dimensions: 16"W x 16"D x 23"T.
Materials: Black lacquered maple plywood and dyed veneer. Dimensions: 24"W x 12"D x 23"T.
The Maze Stool/Table is a dual function furniture piece. This piece is offered in three colors, Red Koto, Maple, and Walnut. 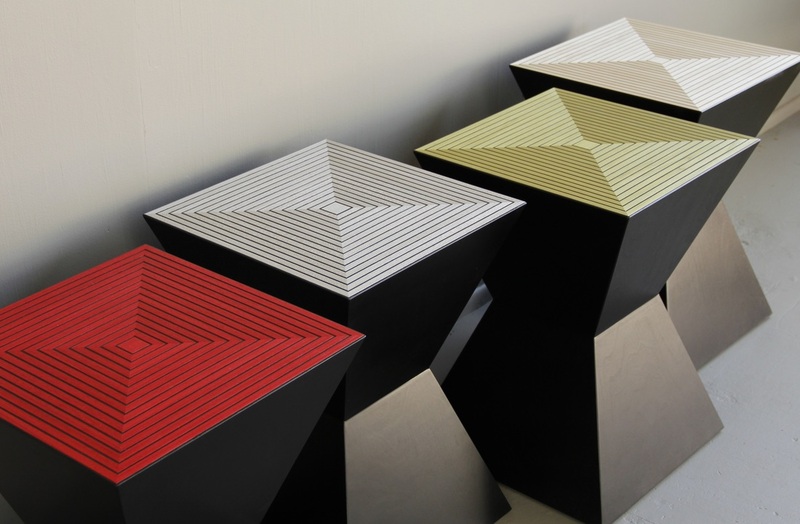 As with all the pieces in the Maze Collection the focus is on flexibility in design. The Maze Stool/Table can be purchased individually or in groupings of the same color or a variety of colors to provide a larger table or seating area. 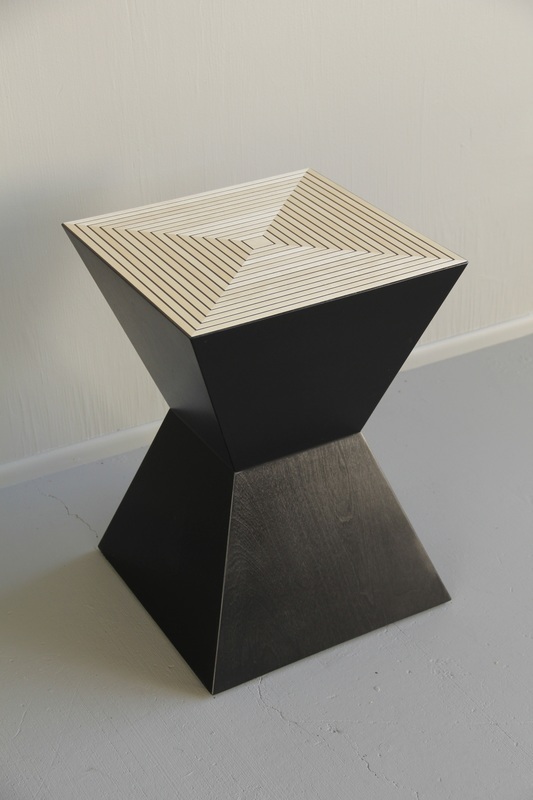 Constructed of black dyed maple with Red Koto, Maple or Walnut top surfaces. This piece features a meticulous grooved top surface in three striking colors and a solid bottom. Available in a variety of colors. Samples are available upon request. 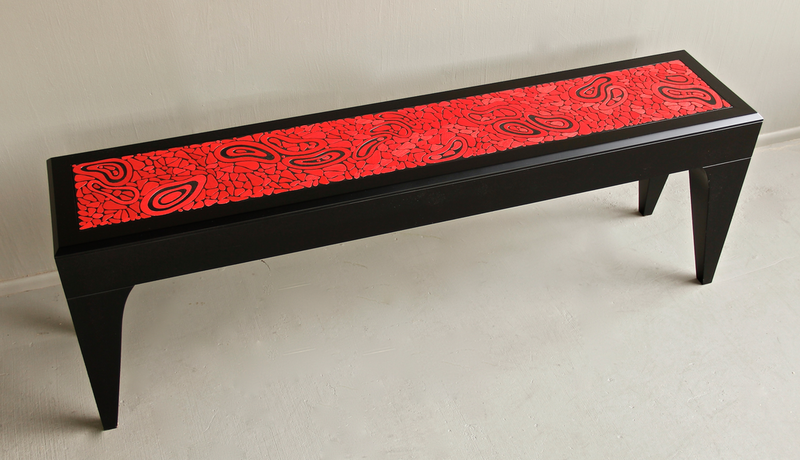 Dimensions: 15.25"W x 15.25"D x 18"T.
Black lacquered maple with a lively array of dyed koto veneered elements on the top surface. Red shown here. The Pebble Console Table features a gently curved bottom and an intricate pebble shaped veneer application on the top surface. Each piece is applied individually. Constructed of Maple and Poplar with a black lacquered finish. Dimensions: 31.0in H x 52.5in W x 16.0in D.